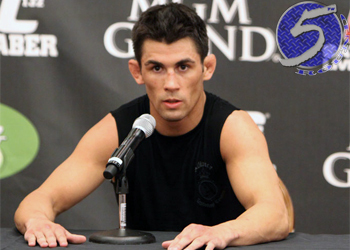 Happy two-year anniversary, Dominick Cruz (pictured)! Well, the UFC bantamweight champion probably isn’t throwing a celebratory party to commemorate the last time he entered the Octagon. Exactly two years ago today, Cruz posted a unanimous decision win over Demetrious Johnson to notch his fourth straight title defense under Zuffa (two in WEC and two in UFC). Just to put into perspective how long ago that was, the event aired live on Versus. He was slated to complete his trilogy with Urijah Faber at UFC 148, but blew out his knee while filming the reality show. “The Dominator” hasn’t been seen since, outside of serving as an analyst on various pre- and post-fight UFC shows for FUEL TV and now Fox Sports 1. Faber, who was coaching opposite Cruz in the show, subsequently dropped a lopsided unanimous decision to Renan Barao for the interim bantamweight crown. During Cruz’s extended hiatus, Barao has rattled off five straight wins, three of which ended in devastating fashion, en route to scoring two successful title defenses. Guess what? For the first time during Cruz’s absence, UFC president Dana White is starting to notice who the UFC’s true 135-pound king might be. “Renan Barao is a champion,” White stated this weekend in Brazil. “If you look at Renan Barao and what he has done, he’s beaten everybody that Dominick Cruz would be fighting if Dominick Cruz was healthy and was the champion. So, [the interim label] takes nothing away from [Barao], other than just that pin, that place holder until Dominick Cruz comes back. From the sound of things, it appears White has already come to terms with who the reigning UFC bantamweight champion really is.